I know, I know. It's not even officially Halloween yet (one more day!) and I'm already posting about the holidays. But let's face it - these days, the holidays basically start on November 1st. And if your schedule is, um, intense this time of year like mine is, you need to get motivated earlier than later for holiday projects. Thankfully, the holiday project I'm sharing today is really fun (and easy!) to put together, and the rewards are pretty incredible. Essley is now almost four (her birthday is just three days after Christmas), and because she was at an age last year where she really "got" the holiday season, she's been talking about it nonstop. She brings up memories, asks questions, and most of all, expresses a truly endearing anticipation for the season's arrival. A couple of weeks ago, she asked to see some photos from the holiday seasons she's experienced so far in her life. As looked back through photos on the camera roll on my phone, I realized that we didn't even have a single photo of her or Emmett (or any of us) printed out from the holidays. And that gave me an idea. 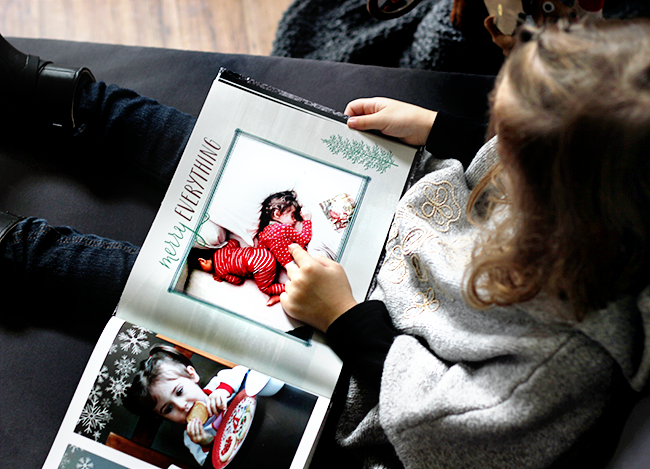 I've made photo books from Snapfish as gifts before, and have always been impressed by the ease of creating them and quality of the finished project. I've also absolutely loved seeing how happy the recipients have been with them. (Robbie still says the one I made him for Father's Day last year is his favorite gift of all time). 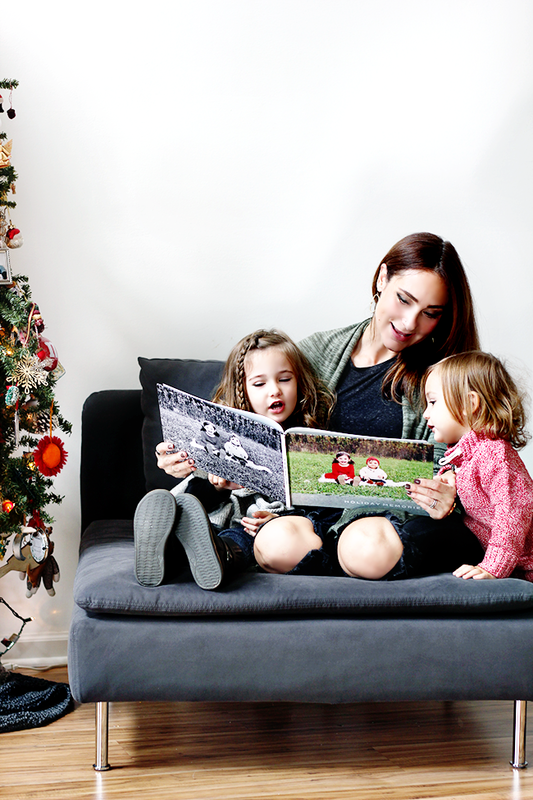 So I decided I'd put together a special photo book of holiday memories to give to Essley and Emmett, knowing how much it would add to their excitement for the season. And I can't tell you guys how much fun I had, and how touched I was, while making it. There were lots of emotions involved, let's just put it that way. 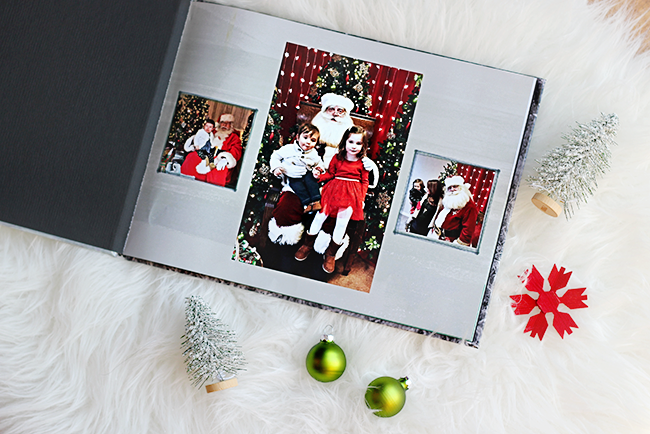 I chose the 8x11 Hardcover Photo Book (I'd gotten this one before and loved the size), then went with the "Winter Joy" theme (so pretty). I uploaded all of the holiday photos I could find on my phone (you can also use your desktop, Instagram, or Facebook to upload) from the last three years of holidays seasons (since Essley was born), and then played around with the different layouts, backgrounds, patterns, fonts, and the hundreds of embellishments available. The Winter Joy Theme made it so each page was filled in (love how easy that is! ), but I changed around about half of them so I could highlight different photos and make the book unique. I chose my favorite photo of the kids from last year's holiday season for the front cover, and a used a black and white version of it for the fact. 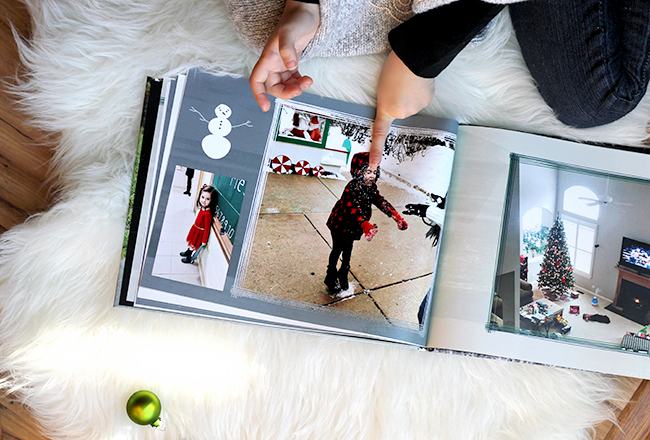 For the inside photos, I included all sorts of different memories - from the kids visiting Santa to them opening presents to Christmas mornings with their grandparents to them snuggled up together watching holiday movies. 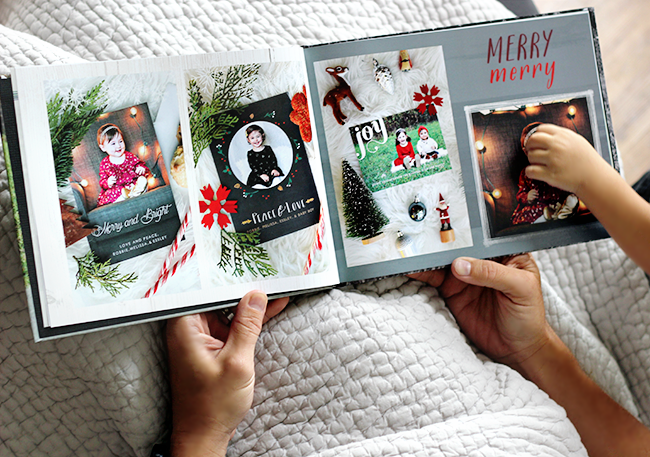 I'm a huge fan of the how you can personalize Snapfish's photo books to make them into family keepsakes that can be enjoyed year after year. And I love how budget friendly they are as well. 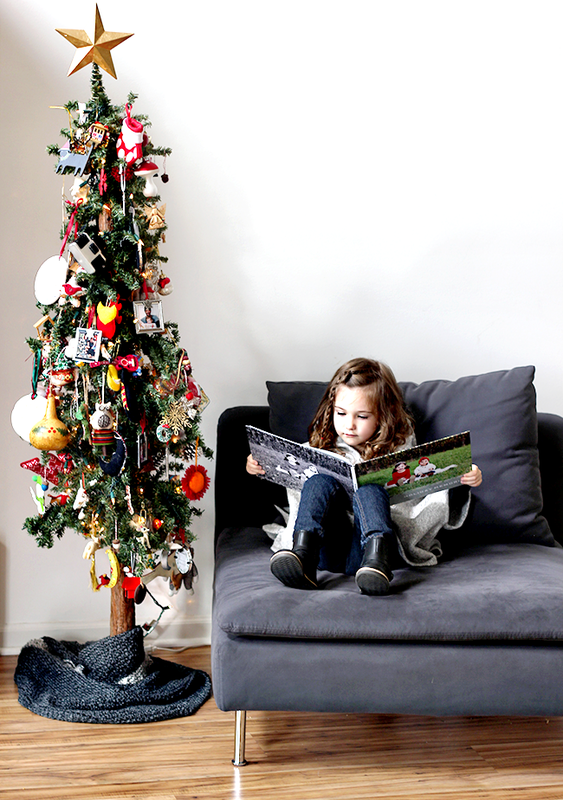 The day the photo book arrived, I surprised Essley when she got home from school with the Christmas tree set up and plugged in (just for the day; we'll bring it back up from the basement in a few weeks). She was thrilled. Then I told her to close her eyes, and I presented her with the photo book. She could not believe that she was looking at a special holiday book with Emmett's and her pictures throughout it. She told me it was the best present she'd ever gotten - which admittedly she says pretty much every time she gets a gift, but I believed her that it was one of her all time favorites. Emmett was all sorts of excited too, and sat on the floor looking through the pages and pointing at photos for a good twenty minutes. All of us enjoyed looking through it together, and it got us really pumped for this year's holidays. I'm going to make one for every year from now on. 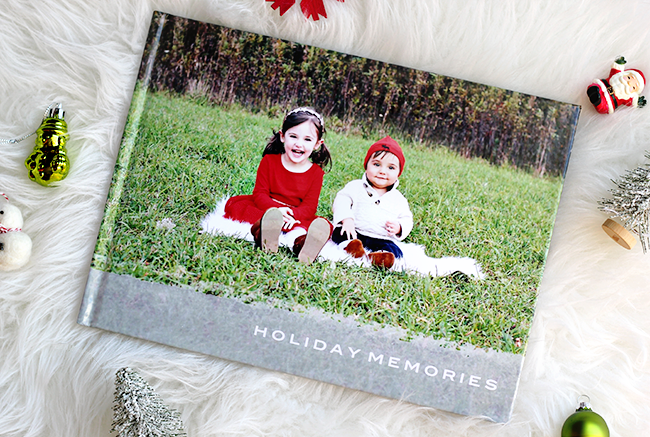 If you're in the market for personalized holiday gifts that come from the heart, or just want to gather your holiday memories into something tangible, I can't recommend a photo book enough. And now is the perfect time to make one, because you can take 40% off at Snapfish with code MELISSABOOK40. Woohoo! This is such a fun idea and the pictures are so cute! This is such a fabulous idea! I love how creative and personalised it is! What a precious idea! And so sweet that she asks about it! I love photo books! Such a cute and fun idea! I’m in love with those photobooks!! Such an awesome gift idea!! Wow, this is so cool! I need to keep this coupon code handy! I made a photo book for each of my two gets on their baptism day. This is so special and makes a perfect gift! Aww I love this, so precious! This is such a great idea! I want to make me one!! This was so sweet! I love that she says its the best gift ever every time, you've raised a thoughtful daughter! 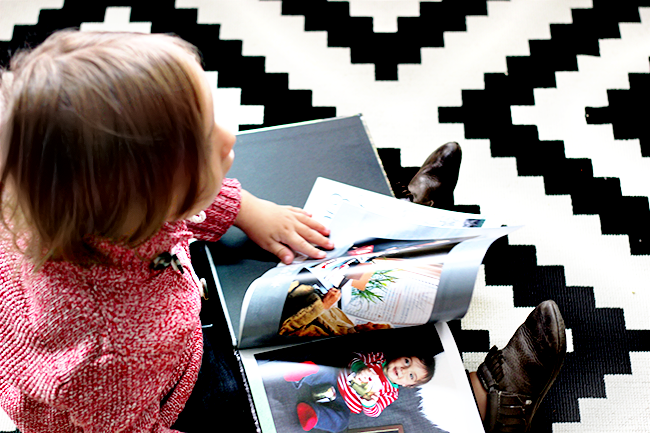 I absolutely adore photo books as gifts, I’ve done it before for my youngest daughter and she loved it! Love making photo books and usually use shutterfly. I'll have to try this company too. Thanks for sharing love! And beautiful family. I love photo books like this!! It’s my goal to create a yearly one so we can look back each year and see all that we did and how the kids grew. Oh my goodness. I totally need to do this. We don't have ANY printed photos. Shame on me lol. So, thank you for the reminder! I should do this for some presents too. Going right now to make a few!